Winter is a time for resting, eat nourishing food, recharge your batteries, and even feel a little depressed or melancholy. The days are short, and the nights are long. It’s nature’s way of showing us to recuperate. We should embrace hibernation, save energy, and get a lot of sleep. Maybe sleep until we’re completely sleeped-out (if that's even a thing). It has been said that the “average” American sleeps for 8 hours every night during wintertime. I honestly would like to meet this “average” American. Because I don't think I've slept 8 hours nightly since...ummm...since...I don't know when. 8? I would love to but I NEVER do. Every single night I crash into bed like a ton of bricks, yet I always wake up 5 minutes before my alarm goes off. It’s not like I’m perpetually tired, but I know I could sleep more. And I never oversleep, not even on weekends. It’s just not in me. Anyways, winter is also the time to eat wholesome food made with tasty, seasonal, and healthy ingredients. Cruciferous vegetables (such as broccoli, cauliflower, kale, cabbage, collard greens, Brussels sprouts, etc.) are in season, and you should make sure to eat lots of them. They’re not only delicious, they’re super healthy too. They contain a wide variety of disease-fighting antioxidants and phytochemicals, and they’re a great source of complex carbs and fiber. Health experts recommend eating at least three servings of cruciferous vegetables each week. Personally, I recommend eating at least one serving a day. These veggies are so easy to steam, roast, saute — why could you possibly want to deprive yourself of such goodness? Mom was right when she said to finish your broccoli! 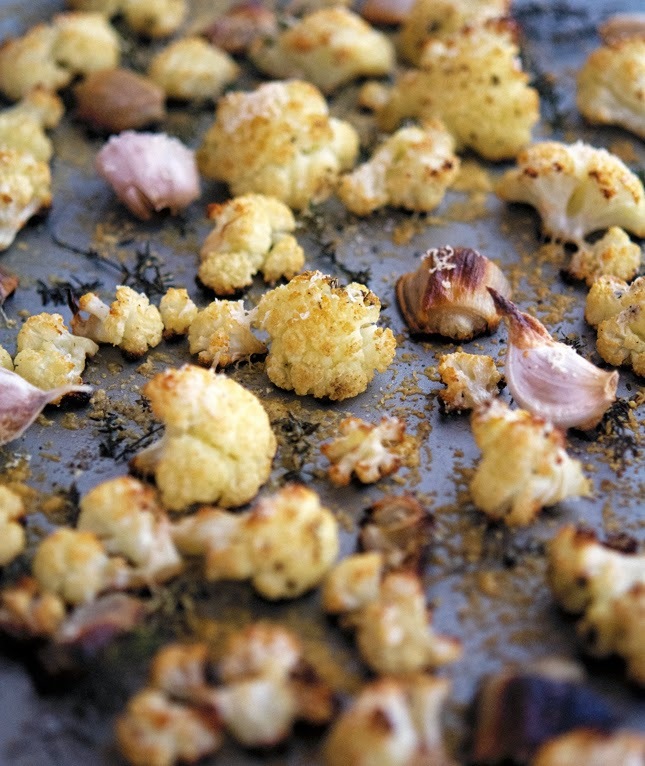 There are many delicious ways to cook cauliflower, but roasting is in a league of its own. When you roast cauliflower, it becomes tender and caramelized and doesn’t smell at all like when it’s boiled or steamed. Roasting elicits a natural sweetness that is to die for. Add a bit of Parmesan cheese - probably the most umami ingredient in western cookery - and you’ve got yourself a total winner. The combo of meaty, caramelized cauliflower florets, slightly burnt shallots, fragrant garlic, and aromatic thyme is my go-to winter side dish. Simple, easy, so very yummy! Parmesan-Roasted Cauliflower Print this recipe! Preheat oven to 425°F (220°C) and place a rack in the middle. 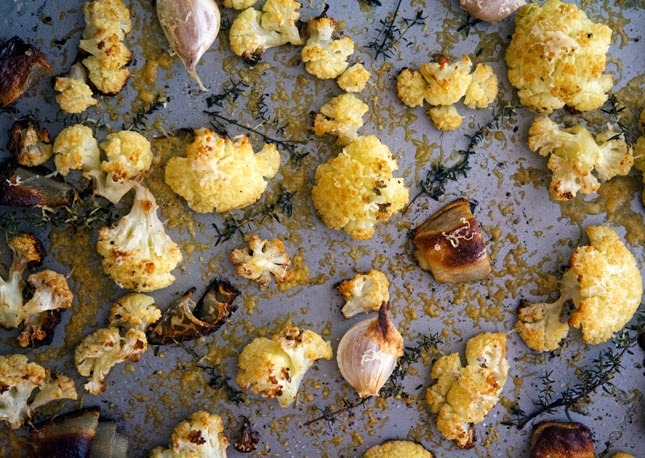 Toss on a large rimmed baking sheet cauliflower florets, shallots, garlic cloves, and thyme sprigs with olive oil, salt, and pepper. Roast in the oven, tossing occasionally, until golden and almost tender, about 35 to 40 minutes. Sprinkle with Parmesan cheese, and roast for further 10 minutes. One serving yields 125 calories, 8 grams of fat, 9 grams of carbs, and 8 grams of protein. I normally don't oversleep either, but today I woke up the sound of someone on my street revving their engine. Grrr...I really could have used the extra minutes before the alarm went off! LOL!! I love roasting vegetables. Your recipes looks so good, especially with Parmesan and garlic. I hate that, as well, almost as much as garbage trucks noise. Actually no, garbage trucks are the worst! now, the most important question for you: is 2015 the year of publication of your own cookbook? Or at least of you starting to write it? I totally hear ya about the sleep, Mike! Even on weekends when I'm allowed to sleep-in a bit longer, I'm always wide awake by like 7am (if not before). I need to become a bear so that I can hibernate for the entire winter. I could also scare people when I'm awake in the summer. Double-bonus points for that one! What's up with this "I need to become a bear" thing? You, my friend, are a wolf. A WOLF. And you are part of a wolfpack. Alright? I feel the same! 7 hours would be a GOOD night for me...5.5 or 6 is typical, sadly enough. One of my pet peeves is waking up before my alarm goes off, but it always happens, haha. Great recipe! Love the combo of Parmesan and cauliflower. Funny I think 6 hours sleep is my regular and I too never sleep in like the good old days on weekends. What happened to me? I used to live to hibernate on Sundays! But, back to these beauties, I love the thyme and shallot addition to these roasted cauliflower florets and that sprinkle with Parmesan cheese, Bellissima! I say let's bring back hibernation. We all need it! O.M.G. Mike this looks spectacular! That's my kinda of food. Looks great man! 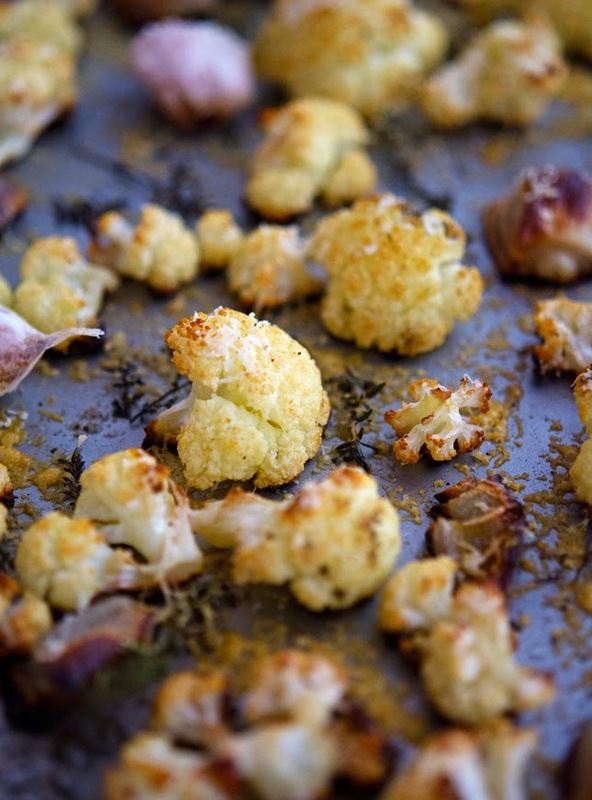 Good grief, I love roasted cauliflower! I can seriously make a dinner out of a head of roasted cauliflower, but I've never tried it with parmesan...this must change now! You should definitely try it with Parmesan Lauren, it's life changing. Yea man, I totally don't sleep 8 hours either. 6 definitely, 7 most of the time. 8... almost never. Maybe those up-state people like Grilling Troll have the relaxed lifestyle where they can sleep 8 or 9 hours a night, who knows hahahaha. I feel like cauliflower always gets jipped on the love, so I'm glad you are giving it the royal treatment it deserves. Love the stuff! Don't get me started on the upstate folks man. They live a quiet, tranquil and happy life. They don't know what it's like to be waken up almost every night by the fire trucks sirens and horns. I always feel a bit depressed during winter, I think it's just part of human nature. And it's totally OK to be a couch potato sometimes, in today's frenetic world it's mandatory to take a breather from time to time! I found a link to a site that has like 943843782743 things to do with cauliflower ------ and I am going to accomplish ALL of those recipes when I go home for the holidays!!!! Wish my stomach luck, LOL!!! I bet the PARM would be FAB on cauliflower but alas, I cannot eat cheese! You like cauliflower? Never. It's probably my favourite veggie too of the cruciferous sort and it HAS to be roasted- I'm posting a copycat recipe on Friday after sampling this particular variety at whole foods then photographing the ingredients on the sub card haha! And again, we must be the same person- I wake up 5 minutes before my alarm. I dream of sleeping 8 hours, I get to sleep 6 if I'm lucky. This last year I have dealt with jet lag a lot and that doesn't help with getting a good nights sleep. Your roasted cauliflower looks great, I have to try it. Hi Mike, love roasted cauliflower!! I always sleep at least 8 hours a night, it's mandatory. 8 hours a night, that's the way to roll C! I am all for embracing hibernation - if I didn't have an alarm, I think I could sleep ALL the way through winter - but there is that job thing and stuff! My sis gets up without an alarm too and you people are an enigma to me!!! This is one wonderful combo of ingredients with cauliflower Mike - I roast broccoli from time to time and love how it doesn't perfume to whole house with it's pungent aroma when roasted! I envy you so much Shashi, you have no idea how much I envy you...I wish I could sleep endless hours and wake up perfectly rested. You're one lucky gal my friend, you should know that! I thought I was the only one running on 6 hours of sleep nightly! I'll sleep when I'm dead. Until then, bring on all the cauli goodness! Pinned! Thanks for the pin T! I've been working on getting a steady 8 hours a night because I really do well with 8+ hours of sleep - I've always wanted to be the kind of person that could get by with less though! 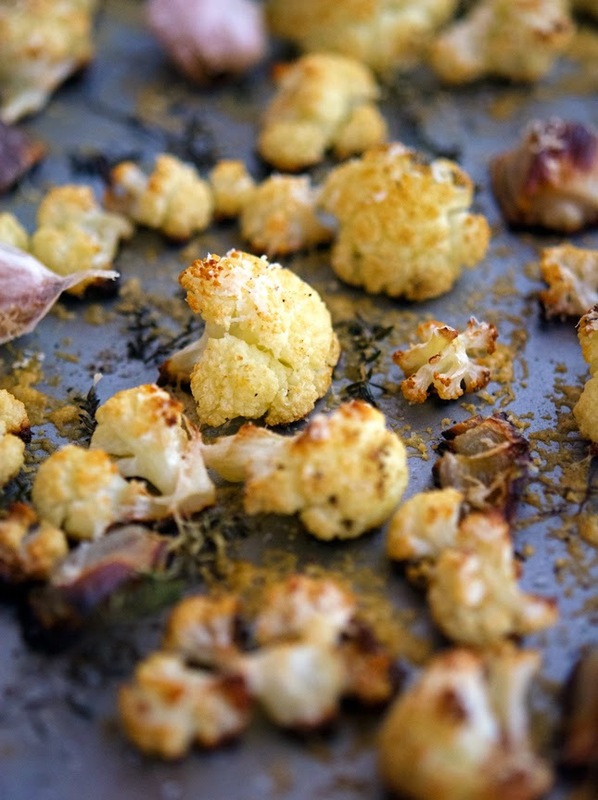 :) Love your recipe - I've never thought of roasting cauliflower before for some reason! Wow, we had this for dinner and it was absolutely fantastic. I didn't have shallots on hand and used an onion, along with a bit more garlic and olive oil than the recipe specified. The end result was cauliflower that tasted like French onion soup. It was divine! Thanks so much for the great recipes. That's awesome Joni, I'm so glad you enjoyed the recipe!